In case you’ve missed the past few weeks, my little one had a birthday at the beginning of the month. We had an Art Themed party for her at the Children’s Museum. Many of the wonderful presents she received (seriously, it was like Christmas!! ), were art related in keeping with the theme of the party. It must be the OCD in me, but it satisfies my type A personality when people give gifts according to the party theme. Sad, I know. Today I’m sharing a few ideas on wrapping an art themed gift that I gave to my nephew a month or so ago. Use a canvas bag as the gift bag. 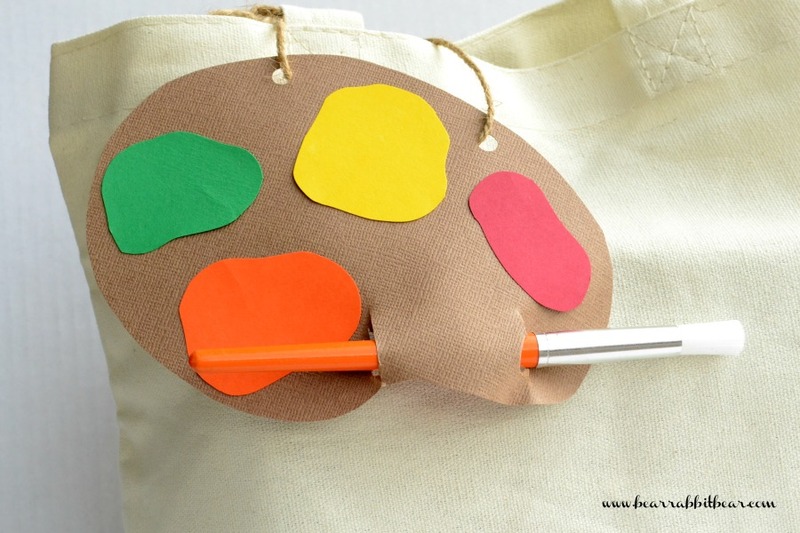 Canvas bags can be painted and decorated, so instead of just a regular gift bag, give the gift in something that can actually be a part of the gift. These bags can be purchased at A.C. Moore or Michael’s. Make a cute tag. I used one of my Art Palette Invites as a template for the gift tag. I then made a hole to insert a paint brush. This is another way to make the actual gift part of the wrapping. Fill the bag with little things to keep a kiddo busy. A box of crayons, a cool notebook, a can of playdough or modeling clay, markers, paints- an art themed gift doesn’t have to be expensive, and the contents can keep a little one busy creating for hours. I may be linking this post to these parties. What an adorable idea! I love the palette with the paintbrush! Great job! Very cute idea! 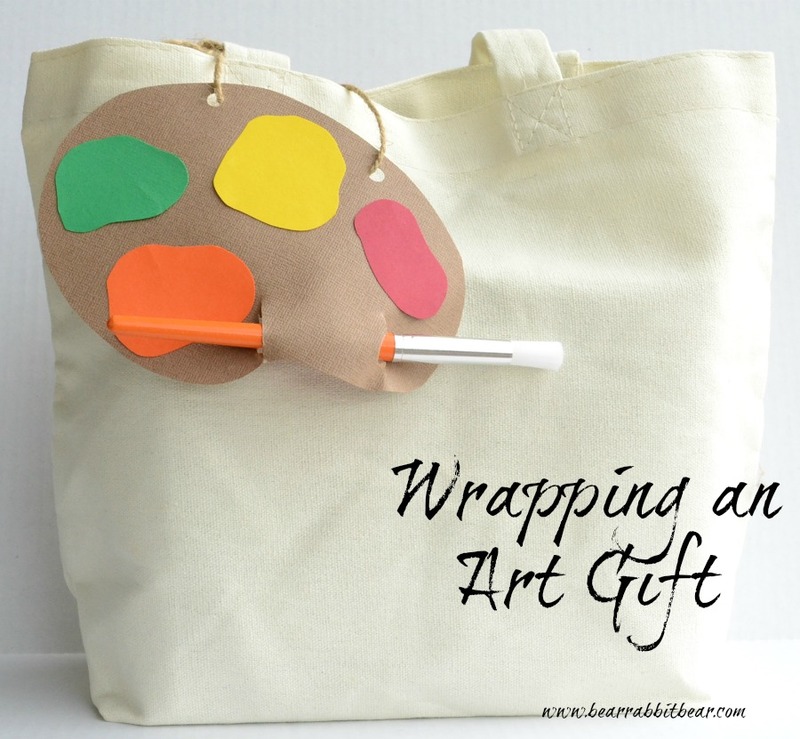 I like your art palette tag and the idea to use a plain canvas tote to “wrap” your gift. I’m pinning this to my board “It’s a Wrap”. Thanks. Aww, I love it, Melanie! So cute! Very cute idea! I am loving all these art themed projects! Cute! Following you via the GFC blog hop. I”m your newest follower from the GFC blog hop! Stopping by from the Hop, New follower! Come back and say HEY! Ummmmmm cutest ever!!!!! So glad you are cohosting so I could find you!!! What a great blog cute kiddos!! So happy I found you!! Found ya on the GFC. Please follow back if you get a chace :). That is so clever. What a fun idea for a party! OH!!! What a great idea!!! Love it! Such a clever idea and that art party sounds like so much fun. We did one for my son too when he turned five at our art museum and I think it was his best party ever. 😀 Thanks for sharing this week on BeColorful.